The world’s first trademarked graphene, Grafoid’s MesoGraf™ is a touchstone for graphene commercial application development. Traditional methods of producing graphene are multi-stage processes, chemically harsh and costly. The MesoGraf™ production process is not. Grafoid believes MesoGraf™ is a ‘game-changer.’ Why? Because MesoGraf™ may afford every company the opportunity to utilize low-cost, high-purity graphene in all of their products. Grafoid’s technology produces near defect-free, high-energy density MesoGraf™ graphene at significant gross margins. The market potential for MesoGraf™ and its derivatives and hybrid materials remains immeasurable. MesoGraf™ is produced directly from raw, unprocessed graphite ore in an economical, consistent and scalable one-step process. Grafoid’s unique patent-pending production process does not use harsh chemicals — normally employed in graphene production — that damage the material or diminish any of its extraordinary properties; creating a high-yield, high-energy density graphene. By eliminating unnecessary steps in today’s known procedures, Grafoid has proven that one does not require energy-consuming temperatures to create graphene in large scale. 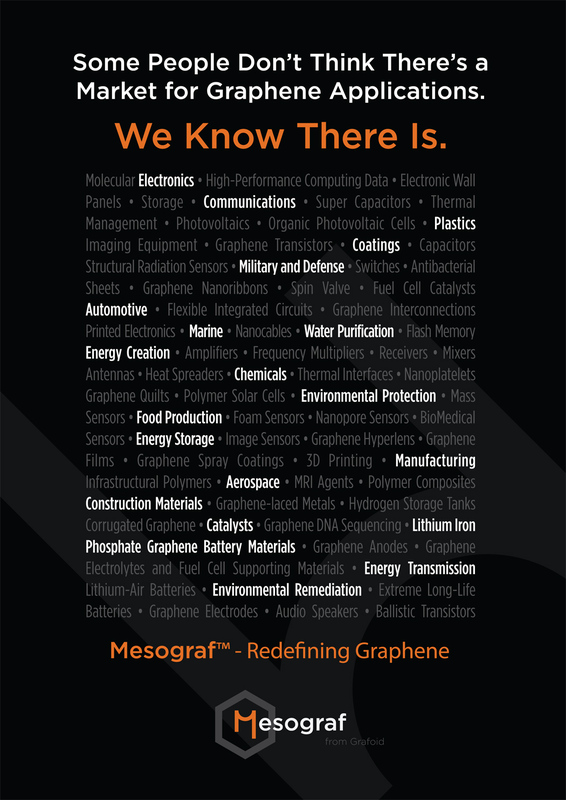 MesoGraf™ achieves Grafoid’s vision of a global standard for economically scalable graphene products that can be tailored to specific industrial, commercial, military, biomedical, and humanitarian applications. Grafoid believes the one-step, low-cost transformation to MesoGraf™ from raw graphite is incomparable in terms of cost competitiveness. The reason graphene has not yet been adopted on a large scale is the cost of the material. In turn, that cost is based on unwieldy and complex production processes. The simple nature of the MesoGraf™ production process has the potential to position Grafoid as the lowest-cost producer of graphene. Because the proprietary process avoids the need to mechanically crush or apply harsh chemicals to the graphite ore, MesoGraf™ exfoliated graphene is produced in near pristine condition, retaining its inherent high-energy density and physical integrity. Graphene yields resulting from MesoGraf’s one-step production process are 500% greater than traditional extraction methods. MesoGraf™ is derived from Focus Graphite’s highly ordered pyrolytic (HOPG) graphite resource, chosen because of its unique characteristics; grading 15% carbon as graphite, making it one of the premier graphite deposits in the world in a stable, secure, mining-friendly North American jurisdiction. MesoGraf™ can be produced in bulk. Grafoid is now producing graphene on a scalable production basis. Guaranteed large-scale supply is critical for commercial and industrial graphene applications. MesoGraf™ is potentially adaptable to the broadest possible range of industrial and consumer product applications. MesoGraf™ can be dispersed in solutions for coatings, mixed with polymers, and provides substantial enhancements in strength and thermal electrical characteristics — and will soon be joined by an expanded family of graphene derivatives for a vast array of applications. Additionally, the MesoGraf™ production process is agnostic and works with any graphite source. Apart from Grafoid’s lead supplier of graphite — Focus Graphite Inc. — other high-grade graphite samples have been tested and approved as sources of secondary supply for MesoGraf™ production. Although the MesoGraf™ production process is economic, scalable, reproducible, and proven, it is also environmentally sustainable. The separation agents used in the MesoGraf™ process create a reaction that is safe. Reaction agents are recyclable; the chemistry is non-oxidative and non-explosive. A key phase of the reaction is completed at room temperature and strong acids are avoided. The graphene transformation process and inventions of Grafoid are unique. So too, is their partnership. Grafoid is the culmination of corporate, academic and scientific collaboration enabling the breakthrough creation of scalable, low-cost functional graphene. A world-class graphite company advancing towards production, Focus Graphite Inc. is a Canadian mid-tier mining developer and sole owner of the high-grade Lac Knife, Québec technology graphite deposit. It has assumed a leading position among emerging graphite developers and plans to be in production by 2017. A publicly traded corporation, Focus Graphite is listed on the Toronto Venture Exchange as FMS; on the New York OTCQX as FCSMF; and, on the Frankfurt Exchange as FKC. Focus Graphite, on behalf of its shareholders, holds a significant equity stake in Grafoid. As one of the world’s most advanced-stage graphite development companies, Focus Graphite aims to become the lowest-cost producer in the world from technology innovation at the mining and processing stages. Additionally, the company is in the early development stage of several of its high-grade graphite properties in Québec. Focus also holds a 50% interest in the Kwyjibo, Québec rare earths, copper, gold and iron ore property in partnership with the Québec government’s mining division, SOQUEM. Kwyjibo is considered to be one of the best rare earth resources in the world. On December 19, 2013, Focus Graphite made mining history by signing the world’s first offtake agreement in the graphite industry. Focus Graphite has a stated goal of becoming a global consolidator of natural flake graphite. Grafoid’s mission is to become a leading developer of graphene commercial applications on a global scale. Grafoid endeavors to become a world-leading graphene research, development and investment company, which jointly establishes international standards for the production of economically scalable, functional graphene and develops graphene applications for the betterment of humanity, in conjunction with like-minded partners. Grafoid has a unique business advantage in the endless supply of raw material to produce MesoGraf™ and the Company’s ability to attract incredible scientific talent who can functionalize this material into practical, near-market-ready applications; and to launch these applications with very strong industry partners around the world. Grafoid is developing next-generation products that use MesoGraf™ with numerous joint venture partners around the world, as opposed to directly selling MesoGraf™ into the open market. This strategic approach affords Grafoid the potential to significantly increase its downstream value. Grafoid firmly believes the MesoGraf™ Global Platform provides the clearest, logical, fastest path to commercialization of the invention and process in a rapidly advancing field. Establishing joint venture partnerships for the development of next-generation products integrating MesoGraf™ graphene drive Grafoid’s business model and the Company already has many high-profile joint ventures and projects with leading industrial and academic partners across the globe. Grafoid has undertaken a sweeping review of the potential graphene market landscape and set a number of priority areas for research and application development. Fifty-nine potential project areas have been identified. Of these 59 project areas, Grafoid is currently involved in 15 joint ventures. Due to reasons of commercial confidentiality, Grafoid is prevented from disclosing many of its ongoing commercial, industrial and military research and development projects.